In Gayoso USA General Hospital. 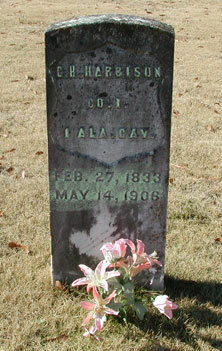 Charles Hill Harbison was born 27 February 1833 in Morgan Co., AL to Samuel H Harbison Jr. and Eliza Louisa Davis. Charles married Mary A Kinney 17 September 1856. They had eight children: Margret L, born November 1858; Olivia Jane, born 1859, died 20 May 1923; Willis M, born 1864; Nancy, born 1867; Pleasant Wiley, born 1869; George, born 1871; Alice, born 1873; and Sarah Harbison. Charles then married Mary Elizabeth Crocker and they had two children: Tandy W, born July 1883; and Samuel J, born August 1886. Charles and his three brothers, Matthew, David, and Pleasant, were all in the 1st Alabama. Charles died 14 May 1906 in Good Hope, Cullman Co., AL.